These bar stools were perfect for a very small counter in my kitchen. Minimalist design and heavily padded seats . Purchased two which were easy to assemble. So far I am loving them. The ample cushion of the white faux leather and chrome Jude barstool gives you the perfect reason to linger over coffee or cocktails. With 360-degree swivel and adjustable seat height from 25.6 to 31.5 inches, friends will be popping in much more often. Dimensions 25.6-31.6 in. H. x 15.2 in. 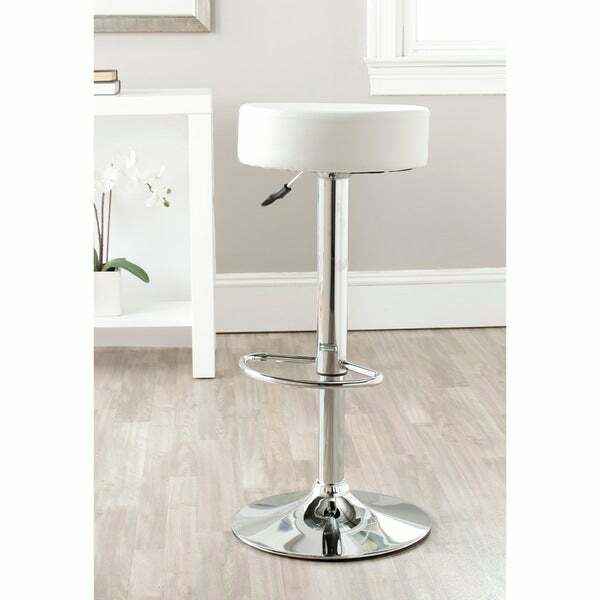 W. x 15.2 in D.
I give these stools a five, easy to assemble bright crisp colors, very comfy...the fancier bar stools I've researched have 4 stars or less but these were the only ones I saw with a five star rating I love mine!! this stool is very padded and comfortable. the lever makes it easy to adjust and putting it together was a snap! We have three of these and they're absolutely perfect. Incredible quality and exceptional value. Everyone wants to know where we got them from! Very happy customer. The only slight glitch is that they get dirty very easily, but on the other hand, they're easy to clean. Wonderful stools, easy assembly, excellent price! Crisp clean fresh bright and easy to put together. Goes perfect with bar i bought from Overstock as well. "How much does this bar stool weigh?" Hello princess0414, this bar stool weighs approximately 13 pounds. I hope this information is helpful. Thank you for shopping with us!